What really went on at the Nazi concentration camp, Dachau, before (and after) April 1945? 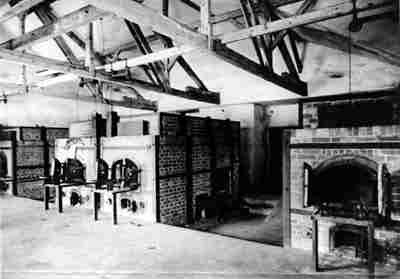 Photographs supporting the claim that the US Army faked the "crematorium" installation at Dachau for an International Dachau Committee. WE have now (Saturday, August 7, 1999) received (in an envelope mailed from an American town known to us on August 2) the photographs referred to: eight are typical GI snapshots in black and white, showing US troop movements in and around the Dachau camp, 155 mm howitzers of the 2nd Howitzer Battalion / 345th Field Artillery leaving the camp for maneuvers in 1964, the main building and entrance, the former front entrance to the Dachau prison camp -- now with a sign reading: "Southern Area Command stockade" -- a guard tower looking south near the main entrance, the fence, moat, and gun tower looking south. The above picture is a picture postcard titled in four languages "furnaces in the new crematorium", issued by the Comité International de Dachau. Our US Army source has annotated this postcard: "This building was erected in '63-64, others added later including memorial tower."